It is vital to work with an attorney and law firm with the resources to manage complex situations. At Pasternack Tilker Ziegler Walsh Stanton & Romano, LLP, our lawyers have assisted thousands of clients for more than 80 years. The total of the settlements we've reached is more than $1 billion. From our law firm's Hicksville, New York, location, we provide full-service legal representation for residents with workers'compensation concerns, personal injury cases, Social Security Disability claims and many other legal issues. With multiple legal departments at Pasternack Tilker Ziegler Walsh Stanton & Romano, LLP, we can manage all of the pertinent claims, whether they stem from a catastrophe such as Hurricane Sandy or a car accident. We are proud to be one of the largest personal injury firms and one of the leading workers'compensation and Social Security law firms in the nation. One accident could lead to multiple claims, which is why our experience with workers'compensation, personal injury and Social Security Disability laws has been so beneficial to our clients. A couple of the many honors our lawyers have received are inclusion in multiple Super Lawyers listings and in The National Trial Lawyer's "Top 100 Trial Lawyers." We offer free consultations. When you need it, our lawyers will visit you at the hospital or at home. Weekend and evening appointments can be arranged as well. To best serve our diverse community, we speak Spanish, Chinese and many other languages. If you suffer from an accident, injury or disease due to your job you are eligible for compensation awards and medical care that is paid by your employer's insurance company. Disabled workers could earn Social Security benefits before reaching retirement age, under the Social Security Disability insurance program (SSD). Our law firm handles the filing of cases for Social Security Disability benefits. Planning your estate early will protect your future, your family's future and offer everyone peace of mind. We will help you plan ahead and act now. When any employee faces employer discrimination because of disability, gender, race, age, pregnancy, religion, national origin or sexual orientation, we will help the employee retain his or her rights. 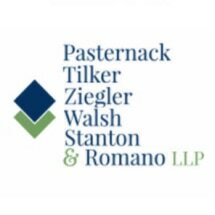 The experienced attorneys at Pasternack Tilker Ziegler Walsh Stanton & Romano, LLP, fight against deceptive, misleading, unfair and secretive practices corporations use to defraud consumers.